During development of the fourth edition of the Sound RIDER! Guide to Riding Motorcycles in the Columbia River Gorge, a funny thing happened. The book got split into two. One for paved riders (the fifth edition) and one for dual sport enthusiasts. 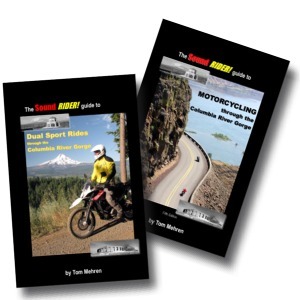 When we began our Rally in the Gorge event back in 2003 (formerly known as Sportbike Northwest), it was apparent from the get-go we needed a book about riding in the area. In 2004 the first Sound RIDER! Guide to motorcycling in the Columbia River Gorge was born. With the addition of dual sport and sport touring bikes to the rally agenda, the book was revised in 2006 and again in 2008. That third edition from 2008 stood the test of time better than the first two featuring more than two dozen rides, some on pavement, and some off. In 2012 we began work on a fourth edition. As we dug into revamping the third edition, it became apparent we had A LOT of rides and one book wasn't going to hold them all. The fourth edition was scrapped. Moving the rally to Hood River this year, it was time to celebrate the new location and do what was sorely needed. Create two versions of the guide. One on-road and one dual sport. Instead of taking the existing third edition and culling the content from it for the basis of each book, I took a harder route and designed each guide as a new book from the ground up. Each book needed to stand on its own. Of course getting both if you're a dual sport rider will round out your knowledge of the area that much more. The first step was to recreate the directories of accommodations, where to eat, and see and dos from scratch. The first listings were those from right out of my head. I don't know everything about the Gorge, but I know my way around it pretty well. To fill in the gaps, I consulted a number of other resources including area guide publications, chamber websites and the locals. These directories would be shared between the two guides. Then came the task of selecting the rides for each. Rather than create distinct routes throughout, I felt it was better to break the area into six slices, using county lines as the dividing points. Then we created a map for each county slice noting the better motorcycling roads in each and describing each following it's area map. At the end of each county section I did create a recommended area loop ride, similar to what we do with the County Loop series that appears from time to time in the pages of Sound RIDER! What was left behind were the turn by turn directions of the prior editions. Feedback from previous users indicated they could get along better without them. A GPS file is available for each book as an option and utilizes tracks for each recommended road, and routes for each loop. The tracks can be sliced together by the user any way they want, in any software that will read a universal GPX file. The routes can be run on any normal GPS or imported into a smart phone app that has the capability to do so. Part of the beauty of riding in the Gorge is its ability to dish out riding sections that can really help one become a better rider. We know what those places are and what can be achieved by riding them. Over the years we've shared these tips with rally goers as "Ride with a plan" tips. Each of the books highlights a number of these tips specific to the surface type. Highlights from the paved book include a visit to the stunning Vista House, discovering the Secret Roads, riding the roads less travelled through the Cook/Underwood area, riding now paved wagon roads, a rip along the ultimate twisties of the Cooper Spur Road, an introduction to the Three Ranches area and discovering the best area restaurants using the rated guide. Plus much more! For dual sport riders, highlights includes an all day route around Mt. Hood, take a visit to the Cloud Cap Inn, hook up with old unpaved wagon trails, discover where there used to be one of the original area mills, view five Cascade peaks from a single vantage point and search for trolls gnomes and smurfs in a secret forest. Plus much more! So say hello to the latest Sound RIDER! guides to motorcycling in the Columbia River Gorge. We've worked hard to make them the best resource to riding, in one of the best places to ride, in America. To order your copies of the new Sound RIDER! Columbia River Gorge Guides, click here to visit our online store now.